last year at the food co-op. It had beautiful flowers that kept dying and returning for months. Then the plant turned dry and dead looking. I was really sad. 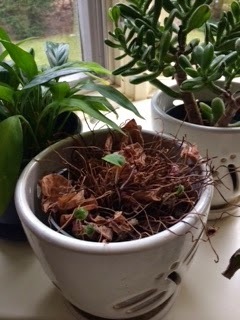 I searched the interwebs and discovered that cyclamen experience dormancy during the summer, and that I should put the plant in a cool, dark place until the fall. So I did. Then, about a month ago, I remembered it was there. I brought it back upstairs and put it on the windowsill. Well, it looked dead. Dead, dead, dead. Anyway, I wanted to write about that, maybe make an nice analogy to something in my life. But national events – grand jury decisions and protests – intervened. You know, I like to pretend I live in a certain kind of world: liberal, reasonable, open to all kinds of religions, sexual preferences, gender designations, career choices, and so on. That liberal elite. Yes, I am very comfortable there. Following the news of the grand jury’s decisions in the cases of Michael Brown and Eric Garner was news of the results of a two year study of police policy and procedures in Cleveland. Conclusion: police often act with excessive force resulting in damaged community relations, not to mention damaged lives. Was anyone surprised? Did anyone read that? I guess the Kerner Report was right. For 5 years I lived at the intersection of those worlds, on the edge of East Harlem and the Upper East Side. My kids went to an elementary school in East Harlem where they were in the minority, color-wise. Also, and to a lesser degree, economically. East Harlem, in case you don’t know, used to be known as Spanish Harlem, or El Barrio, and it’s one of those pockets of Manhattan that remains mostly ungentrified. The school day my children spent in East Harlem, but all of their extra-curricular activities met below 96th Street, in the white part of town. Those five years were an amazing education. I made some friends, first with some of the other white parents, but eventually with some of the non-white parents. That took longer. But I noticed that whatever color they were, my friends were similar to me in key ways, in education, in family’s education primarily, of life expectations for ourselves and our children. We were of the same economic class. The parents of those kids from El Barrio (East Harlem) and I – we didn’t really know each other. The elder daughter was friends with someone from the neighborhood, but her mother really seemed reluctant to let her come to our apartment - and my daughter never entered the vestibule of her building. She was never asked. Nevertheless, Hurricane Katrina was the first real shocker to me. Sure, in ed school I read about the underclass, and I read about de-facto segregation in public schools. Heck, I experienced that. But those images of the poor at the Superdome? My God, what country was that? That was so much more real. All those people, mostly poor, mostly poorly educated, basically abandoned. Horrible to contemplate. They were so unappealing looking, too. But I had to ask myself, what separated me from them? Luck, education, money. Ten years later, ten more years of government policies meant to destroy the social fabric, to eliminate the government’s responsibility to care for people. Ten more years of policies that elevate business values and dehumanize people, and we’ve got this defacto segregation more than ever. Horrible to contemplate. I read in Backlash by Susan Faludi that the Heritage Foundation, that conservative think-tank behind the Moral Majority, had at its founding, the explict goal of turning the clock back to 1954. Well. 1954 was the year of Brown v. Board of Education, that ruled that “Separate but Equal” was not constitutional and gave a lot of momentum to the civil rights movement. Jim Crow laws were still in effect. Abortion illegal. So on. Turning back all the civil rights gains, including women’s rights. People really wanted - want to do this. I cannot understand that. I cannot understand why people would want to do that, but I now understand that people do. So I conclude that I live in a different world than a lot of other people. And this is not ok.
Race, class, education. Those are the boundaries of my little world. I guess I thought it was bigger. I am awakened now. One of my friends wrote on Facebook that she has given up hope. She wrote that she wants a reason to feel some optimism, but she worries that the future will bring more of the same. Well, there is my cyclamen. It looked dead. People who shall remain unidentified made fun of its deadness. Someone moved it off the windowsill, closer to the trash. But I watered it anyway. I noticed that the water didn’t gush out of the bottom of the pot. There were roots holding it in there, buried. And then, just this week, I saw a couple of green shoots. I had been right. I hadn’t given up. And we can’t do it for our country, either. I’d say the good that comes of the bad here is that more people are educated to the reality of the racial and economic divide before us. Laws shaped this situation, and they can reshape it as well. Protests shape the protesters as much as, or more than, those against whom they protest. Those people shape the laws. And the laws shape justice. So, no, I don’t give up hope entirely. I feel that we – I – have been able to ignore the problem for a long time; but now that it’s out in the open, there’s a chance to do something about it. I can't help but feel that America fell into a coma after eating all the sugar, reality tv, and video games. It's time to wake up. You are right to remind us not to give up hope, but to take an active role in 'shaping' our laws. Yes, I like the analogy. After all the gains in civil rights, women's rights, we got hypnotized by our "progress" and all that other stuff you mention. I don't know that song - but now I'll have to find it, just to see what you mean. You made me laugh!